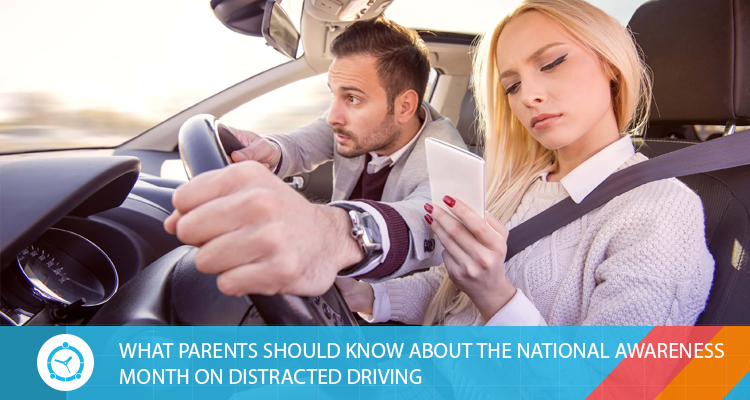 You are here: Home › WHAT SHOULD PARENTS KNOW ABOUT THE NATIONAL AWARENESS MONTH ON DISTRACTED DRIVING? There is an epidemic of distractions while driving that is injuring and in too many cases killing people in accidents involving teen drivers, shows a news report. According to the American Automobile Association (AAA), about 60% of car accidents involving teenagers happen while those young inexperienced drivers are talking, sending and receiving text messages or distracted in some other way. And that happens much more often in the summer,. “I think everyone understands that being distracted while driving is bad and should not be done, but until now the parents did not have data available to suggest that it is a much bigger problem that they should worry about their teenage children,” said Jake Nelson, director of advocacy and research on traffic safety of the AAA. Talking to the passengers explained 15 percent of the crashes. Speaking, sending and receiving text messages or operating a cell phone accounted for 12 percent of accidents. Looking at something inside the car explained 11 percent of the accidents. In the report, researchers also found that teens were more likely to send and receive text messages or look at the phone than to use it to talk. In addition, a phenomenon known as “blindness for lack of attention,” which is when you do not see something that is right in front of you because you are focused on something else, can be lethal, he warned. Talk quickly and often about the dangers of distractions. Count on an agreement between a parent and a teen that sets standards against driving distractions. Teach by example: while driving, keep your eyes on the road. TECHNOLOGICAL INSOMNIA AND ITS TREATMENT!